Please find below all the details about our next yoga retreat this year. After Spain and Italy, we opted for the Algarve, in Southern Portugal! The property we will be staying at is called Monte na Luz and is set in the hills, north of Loulé. It is spread over 2 hectares and has a lovely swimming pool. The rooms are simple and spread over the main building and three small houses. Every room has its own bathroom. The retreat is an opportunity to take your yoga practice deeper and also recharge your batteries in a beautiful surrounding. Following a similar structure as our previous retreats, there will be two yoga sessions a day and a lot of free time. We will practice in a spacious (100m2) octagonal studio filled with natural light and overlooking the hills. Mats, bolsters, belts and blocks are all available on site. The morning session will take place from 7.15 to 9.30 and be followed by a well-deserved breakfast. The evening session will be from 17.15 to 19.15 followed by dinner. Lunch will also be served on the premises. The grounds of Monte na Luz offer a beautiful space to walk and relax. It has views over both the ocean and the hills. The nearest beaches are about a 20 minutes drive away and the city of Loulé can make for a lovely outing with its castle, churches and market. Click here for Monte na Luz's website. Please note that all the meals provided will be vegetarian. Expect delicious, healthy and varied food! Food intolerances can be catered for so please get in touch if you have any dietary requirements and I will pass them on to our host Frank who will advise our cooks. Monte na Luz has 15 rooms and offers triple, double and single options. There are 4 rooms available for single occupancy with a double bed, 8 rooms available to share with one other person and 3 rooms available to share with two other persons. The prices below are per person and include accommodation, 3 vegetarian meals a day and 2 yoga sessions per day. Spaces available are limited to 15 and availability of the rooms will be on a first come-first served basis. Thank you for your understanding! Faro is the closest airport , about a 25 minutes drive to Monte na Luz. For a transfer from Faro airport to Monte na Luz, a cab costs about €27 per car (maximum 4 people). Once you have reserved your space, please do not book your plane tickets until I can advise you on what flights to book (airline and times) as I will try to coordinate the group to minimise the cost and numbers of transfers. Of course that is unless you decide to hire a car or don't mind making your way to the property on your own. To reserve your space, please drop me a mail at floyoga.mail@gmail.com. A £300 deposit will be required on booking to secure your space and the remaining amount will be due in full by 1st May 2015. If you have any questions, do not hesitate to get hold of me. Following the success of the Puglia retreat (which is now sold out), I have decided to add an alpine yoga getaway - just in case some of you missed out! We will spend 5 days at La Ferme du Ciel, a luxurious chalet near the village of Samoëns in the French Alps. All the rooms are en-suite, and we will also have access to the outdoor pool, jacuzzi and indoor sauna. 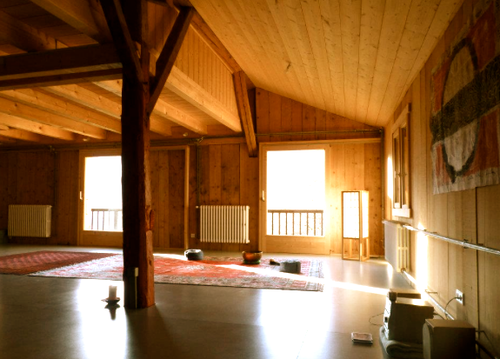 We will be driven to yoga sessions, which will take place nearby at The Dojo, a spacious studio just 5 minutes from the chalet. Arriving on Tuesday 2nd September in the morning, departing on Sunday 7th midday. We will be holding morning and evening sessions totalling 9 sessions. Also INCLUDED is a trip to la Cascade du Rouget, a stunningly beautiful mountain waterfall. We will also take a full-day hike with a fully-qualified local guide - making sure we get the most out of our alpine location! Morning sessions are 7:15 - 9:15, and will include breathing exercises, meditation and asana practice - dynamic and restorative -. After breakfast and free time back at La Ferme du Ciel, lunch will be served around 13:00 (with the exception of the hiking day, which also includes a packed lunch). Evening sessions are 17:30 - 19:30 followed by dinner. Massage therapists available - description and fees available on arrival. All meals provided will be vegetarian, cooked by the lovely Michele Willmott, who will also be on hand for life-coaching sessions for those who are interested. More info here. La Ferme du Ciel has 5 bedrooms as well as an apartment and all but one bedroom are available on a shared option basis. Only one single occupancy option possible! The prices below are per person and include accommodation, all meals, 9 yoga sessions, a trip to La Cascade du Rouget and a full day hike, airport transfers from/to Geneva airport to the venue and all other transfers. Spaces are limited to 11 and availability of the rooms will be on a first come-first served basis. Geneva is the closest airport to Samoëns; and there are over 26 flights per day from London to Geneva. Once you have reserved your space, please do not book your flights until I can advise you on which ones to book. The airport is an hour’s drive away from La Ferme du Ciel and for this reason, I will coordinate the group to facilitate our transfers. To secure your space, please drop me a mail at floyoga.mail@gmail.com. A £350 deposit will be required on booking. The remaining amount will be due in full by 20th June 2014. I look forward to welcoming you in the Alps! Our next yoga retreat will take place 7th-14th June 2014 in Puglia, South of Italy, in the jaw-dropping property of La Rosa dei 4 Venti. This ancient farmhouse or masseria dating back from the 17th century was beautifully restored and has been a space for meditation, sharing, yoga and anything related to expanding our consciousness for the last four years, so it offers plenty of natural beauty and good vibes for us to enjoy! The retreat is an opportunity to find renewed inspiration for your body, mind and spirit as well as to recharge your batteries. A typical day will be as shown below. The grounds offer a beautiful space to refresh you. The property has a swimming pool, wi-fi connection, a yoga studio and an outdoor yoga platform, treatment rooms and a private forest with a meditation path. Yoga equipment is also available on site including: mats, bolsters, pillows, blocks and straps. Click here to view La Rosa dei 4 Venti and its surroundings. You will also find more information about the location, the team and their food philosophy. Please note that all the meals provided will be vegetarian. There will also be some wine made available for dinner only at extra cost for those of you keen to sample some of the local produce. Now for the practicalities. La Rosa dei 4 Venti offers triple, double and single options. The prices below are per person and include accommodation, 3 vegetarian and macrobiotic meals a day, and 2 yoga sessions per day. Spaces available are limited to 15 and availability of the rooms will be on a first come-first served basis. Brindisi is the closest airport but booking our flights from London to Bari airport (which is a 90-minute drive away) might be the best option. Once you have reserved your space, please do not book your plane tickets until I can advise you on what flights to book (airline and times) as I will try to coordinate the group to minimise the cost and numbers of transfers. For a vehicle of 8 people, the transfer from/to Bari will cost €220 one way and for a vehicle of a capacity of 18 (remember your school days…? ), €330 one way. For those of you who would like to visit the surroundings while staying at La Rosa dei 4 Venti, there is a taxi/shuttle service at the venue. Details of the costs will be made available on request. If you intend to explore the area quite a bit in your spare time, I would definitely advise to arrange your own car rental as it would work out more cost-effective and of course, you will have a lot more freedom! A £350 deposit will be required on booking to secure your space and the remaining amount will be due in full by 1st March 2014. Summer just got a little closer…! I am looking forward to hearing from you.